Trinity Church was designed by Henry Stirling Trigg, the grandson of Henry Trigg who founded the congregation back in 1843. The older Henry arrived in the Swan River Colony in 1829. He initially attended the Anglican Church, then joined the Wesleyans, before establishing a Congregational church in his own home. In 1893, plans for a new church were prepared by Henry Stirling Trigg, who was not only the grandson of Henry Trigg he was also Perth’s first Australian-born architect. The contractors were the Bunning Brothers, who agreed on a contract price of £6,100. Trigg designed the building in the very fashionable American Romanesque style, which was an attempt to break free from British models of architecture. Reviewers praised how contemporary Trinity Church looked. In 1923, further developments took place at the rear of the church, with the construction of Trinity Buildings and Trinity Arcade, and in 1981 a shopping arcade linked Trinity Church with Trinity Buildings in Hay Street and with St. George’s Terrace. Today, Trinity Church is part of the Uniting Church and is one of the most striking buildings on St George’s Terrace. In 1845, Trigg and his friends built a small chapel in William Street. Trigg conducted all the services himself until, in 1852, the London Missionary Society sent out Rev. James Leonard to be the first ordained Congregational minister. The chapel quickly proved to be too small, so in 1863 the congregation decided to build a church in St. George’s Terrace. This was designed by Richard Roach Jewell, who would later draw up the plans for the Town Hall on Barrack Street. By 1892, an even bigger church was needed, so it was decided to put a new building in front of the existing one. To help fund this, an adjoining suite of offices was erected so they could be leased out. The plans were prepared by Henry Stirling Trigg, who was not only the grandson of Henry Trigg he was also Perth’s first Australian-born architect. The contractors were the Bunning Brothers, who agreed on a contract price of £6,100. The foundation stone for Trinity Church was laid by the Governor on 22 March 1893. The new church provided accommodation for 750 people on the ground floor and for 100 in the galleries. Other features included making sure the speaker’s voice could be heard in every part of the church. Although the church was to have been chairs, owing to the slope in the floor, locally crafted pews were substituted. It is essentially a building which belongs to modern times, and whether you look at it from outside or inside, you cannot but feel that it is a church of the day, built after the fashion of the day, with a view to carry out its objects by means of those accessories which the men of the day consider requisite. Dr Bevan from the Collins Street Congregational Church, Melbourne, came to Perth to conduct the opening services, which was attended by Sir John and Lady Forrest, Sir James Lee Steere, the Mayor of Perth, Alexander Forrest, and a large crowd of Perth’s leading citizens. Forrest proclaimed that such a magnificent building “would be an ornament to the principal street of the city. Such an undertaking showed that the people were progressing materially and morally, and that progress was the order of the day”. In 1923, further developments took place at the rear of the church, with the construction of Trinity Buildings and Trinity Arcade, and in 1981 a shopping arcade linked Trinity Church with Trinity Buildings in Hay Street and with St. George’s Terrace. 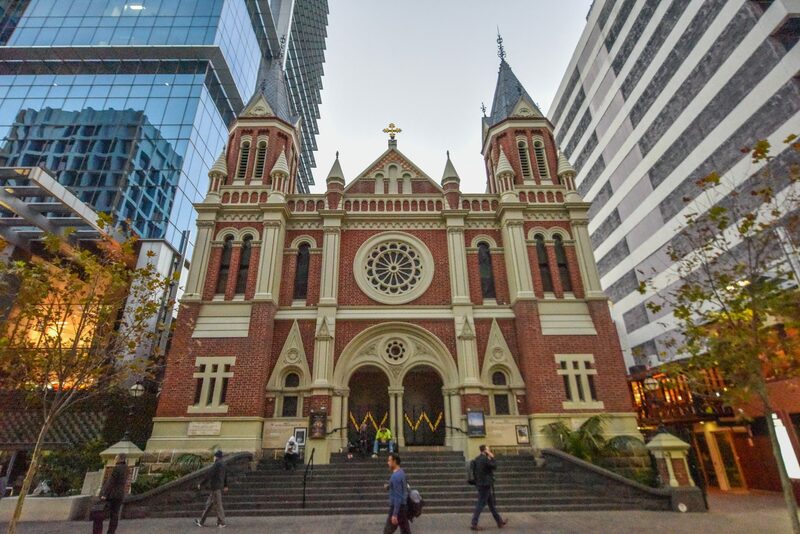 Today, Trinity Church is part of the Uniting Church and is one of the most striking buildings on St George’s Terrace.